Companion wedding dress to the white one. Bought by MagnusXL for ravenkanzaki to use. Comment or note if you'd like to buy! Bonjours I have one proposals to be made for you. A friend and I let us make history(story) where we need holding(dress). We would want to know if you are willing to allow us to use your drawings while advertising you thanks to our history(story). We promise you not to plagiarize your masterpiece (which(who) are absolutely magnificent) after all is has your advantage. You can find us on the skyrock blog Emilie-Lise or on my Facebook Akairo Hainé. Do you mind if I can make this into an actual dress? I've been thinking about turning drawing into designs, and this is amazing! This dress is just gorgeous~! Absolutely fantastic design! How are you able to draw these on the computer? What kind of software do you use? These are some of my favorite designs I have seen. Amazing job! i love the colors so much! 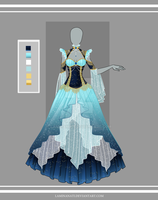 It remindes me of the dress that is presented at the fashion show in the anime Paradise Kiss!! Wow! The colors are so beautiful! Oh, wow! I love this! That dress reminds me of Princess Luna from MLP: Friendship is Magic. I was thinking about her too when I saw this dress! It's beautiful, but it seems dysfunctional. Oh its so gorgeous! I would love to buy it but I'm holding money aside. But nice work! Oh my goodness! I simply love this dress! Now if only I could have one made to wear in reality! Simply stunning! I would buy a dress like that! reminds me of idris from "the doctors wife"